BALTIMORE, MD--(Marketwired - December 09, 2015) - Danfoss, a leading manufacturer of high-efficiency electronic and mechanical components, controls, compressors and variable frequency drives for air-conditioning, heating, refrigeration, industrial, and water systems, yesterday broke ground on a new state-of-the-art laboratory for the testing of HVACR equipment. 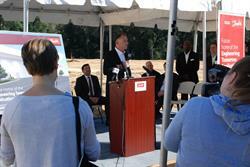 The new center also will facilitate training and serve as a research and development center for future innovation. The 22,000-square-foot "Engineering Tomorrow Application Development Center" will be built in Tallahassee, Fla., expanding the existing facility that houses the engineering and manufacturing of Danfoss Turbocor oil-free, magnetic bearing compressors. "One of the major drivers behind this significant investment is the increasing needs of our customers to comply with the unprecedented number of U.S. EPA and DOE regulations and testing requirements," explained John Galyen, president, Danfoss North America. "We feel it is critical for us to help our industry prepare for the transition ahead to meet low-GWP refrigerant targets and higher energy efficiency levels. There is not enough existing lab capacity in the United States to meet the demands, so this investment will enable our customers to accelerate the path of their next-generation equipment." The Center will include three sets of psychrometric rooms with the capability of testing air-conditioning systems, including residential equipment and rooftop units from 2.5 to 50 tons and air-cooled chillers up to 150 tons. "The investment in this Application Development Center coincides with the launch of a new global brand -- Engineering Tomorrow -- providing technologies and solutions that do more with less today and a broad portfolio and expertise to meet the world's growing set of challenges in infrastructure, a safe food supply, energy efficiency and low-GWP, climate-friendly solutions. Toward that end, we are helping the industry prepare for the regulation and standards shaping our future," said Galyen. 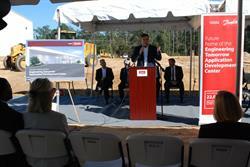 The groundbreaking ceremony took place at the Danfoss Turbocor Compressors facility in Tallahassee. Local officials, including Tallahassee Mayor Andrew Gillum and Leon County Commissioners, as well as representatives from the Economic Development Council of Tallahassee/Leon County, Leon County Research & Development Authority, and Florida State University, were onsite to mark the occasion. 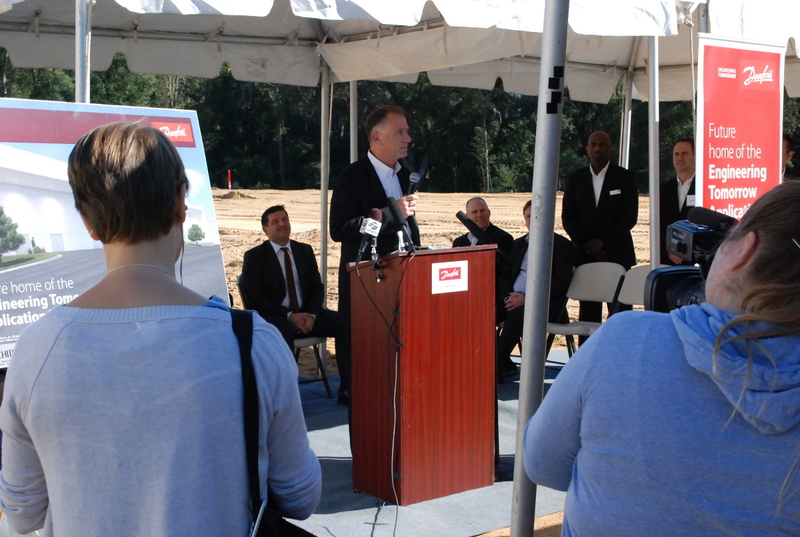 Ricardo Schneider, president of Danfoss Turbocor Compressors, commented, "The launch of the Application Development Center in Tallahassee signifies further collaboration with Florida State University and their magnetic laboratory, bringing advanced innovation to the market." Danfoss engineers technologies that enable the world of tomorrow to do more with less. We meet the growing need for infrastructure, food supply, energy efficiency and climate-friendly solutions. Our products and services are used in areas such as refrigeration, air conditioning, heating, motor control and mobile machinery. We are also active in the field of renewable energy as well as district heating infrastructure for cities and urban communities. Our innovative engineering dates back to 1933 and today Danfoss is a world-leader, employing 24,000 employees and serving customers in more than 100 countries. We are still privately held by the founding family. Read more about us at www.danfoss.com. 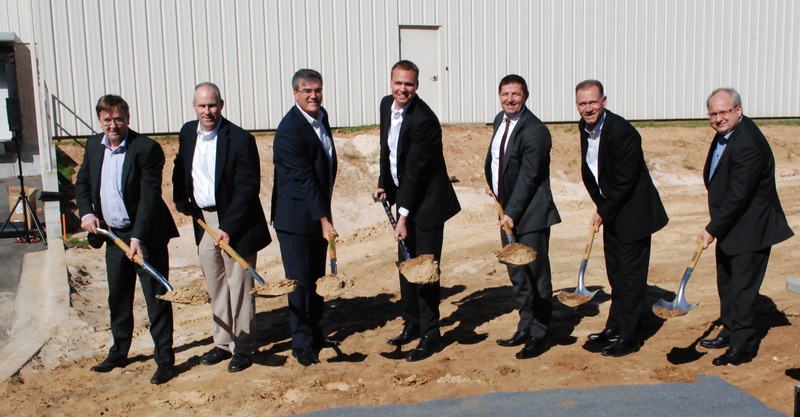 Danfoss breaks ground on its new "Engineering Tomorrow Application Development Center" -- a new, 22-000-square-foot, state-of-the-art laboratory for the testing of HVACR equipment in Tallahassee, Fla. From left to right: Noel Ryan, president - commercial compressors, Danfoss; Scott Hein, senior director, R&D - drives segment, Danfoss; Ricardo Schneider, president, Danfoss Turbocor Compressors; Mads-Peter Clausen, member of the Danfoss Board of Directors; Jurgen Fischer, president - cooling segment, Danfoss; John Galyen, president, Danfoss North America; and Stefan Pietrek, senior director, global applications, Danfoss.